Scream uses its own protocol for transmitting seismic data over the Internet. 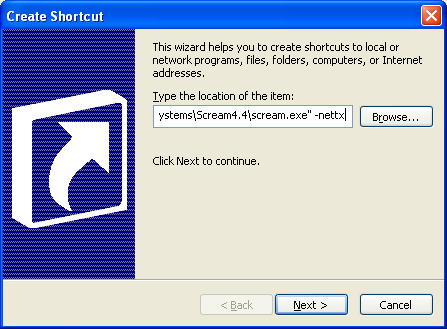 The Network Control window within Scream! lets you manage a seismic array with multiple data sources, using this protocol. There are two ways a Scream! client can receive data from a server. For this method, the Scream! server keeps a list of clients and periodically sends them data in UDP packets. If the client is behind a firewall, as in the diagram, you must open the relevant UDP port in the firewall before any data will be received. Most firewalls are configured to allow outgoing packets through, so the server does not need special configuration. However, it is likely that you will want the server to be able to aid in gap recovery (see below), for which you need to open the TCP port with the same number. To configure Scream! to push data to a client, click the My Server tab on the Network Control window, right-click in the top box (the client list), and choose Add Client…. Enter the client’s IP address and a port number, and click OK. Open this port for TCP connections on the server’s firewall, if applicable. On the client side, view the My Client tab, and tick the Receive UDP Data box. Set the Port used for all network communications to the port number you used above. Configure the client’s firewall to unblock this port for UDP. In this method, the client keeps track of its own servers and requests them to send it data using the commands GCFSEND and GCFSTOP. 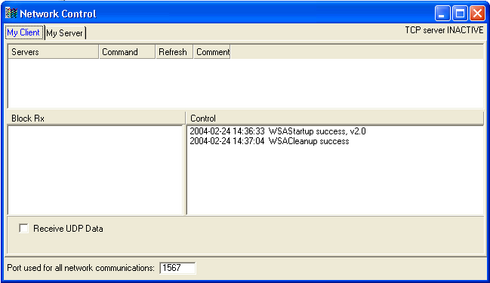 Both commands and data are sent over UDP. In this situation, UDP ports need to be unblocked at both the server and the client side, since the server must be able to receive these UDP commands. To configure Scream! to request data from a server, click the My Client tab of the Network Control window, right-click in the top box (the server list), and choose Add UDP Server…. Enter the server’s IP address and port number, and click OK. Scream! will normally only transmit data it receives from directly-connected instruments, and not data it receives over the network. This helps to prevent network loops. A command-line option is available which allows you to override this behaviour: see the Scream! manual for more details. When Scream! receives data over a network connection, it is configured by default not to forward it back out over the network. This is to prevent the inadvertent creation of forwarding loops which could rapidly consume sufficient system resources to render the host computer unusable. If you wish to forward data which has been received over a network, you should invoke Scream with the -nettx option, which removes this safeguard. A check-box labelled “Transmit Data from Network” will appear in the “My Server” pane of the “Network Control” window. When ticked, packets received by Scream! over the network will be forwarded on to network clients. Please take particular care when planning the data routes in order to avoid any loops. Note: The -nettx option has been removed in Scream! 4.5 and later but it is still necessary to tick the “Transmit Data from Network” check-box if you want to forward data which has been received over a network. Click the “Next” button to continue and give the shortcut a suitable name. If desired, the resulting shortcut can be dragged and dropped onto the start button in order to provide a start-menu icon. Because the gap recovery process uses TCP connections, you must open a TCP port on the server’s firewall in addition to the UDP port(s). The port number is the same as for UDP. If you do not open this TCP port, data will still be received, but any gaps that occur will not be filled in. Unlike UDP connections, TCP connections persist even when data are not being sent. After the client initiates the TCP connection, the server can send the requested data over the same connection. Because of this, you do not need to open a TCP port on the client side. Many firewalls and cable modems are set up with Network Address Translation active. With NAT, hosts behind the firewall are given addresses on a local IP network, sharing a single outward-facing IP address. When a host behind the firewall creates a TCP connection, the NAT software ensures that the relevant packets are forwarded to the correct host. When a host on the outside of the firewall attempts to send a packet through, the NAT software cannot tell which host on the inside to send the packets to, so they are blocked. Thus, hosts behind a NAT firewall in its default configuration cannot receive UDP packets at all (since there is no persistent connection), and cannot accept TCP connections from outside. Because of this, a NAT firewall is very effective at preventing attacks from outside. In order to receive Scream! data from behind a NAT firewall, you must explicitly tell the firewall to forward UDP packets from the Scream! server to the client. This is done using port forwarding. The details of how to set up port forwarding depend on the particular firewall, but they all work by maintaining a list of ports and hosts which are listening on that port. Thus if your Scream! client is listening on port 1567, you should manually configure your firewall to pass all UDP packets on port 1567 to the Scream! client’s local IP address. The TCP recovery procedure is unaffected by NAT, since the client initiates the TCP connection. 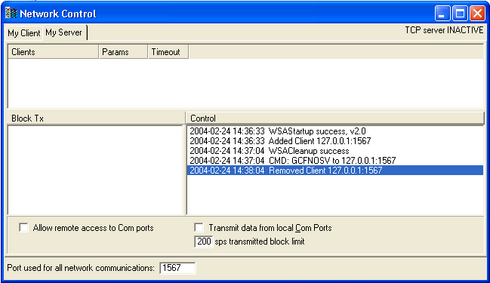 This means the firewall can automatically determine where to send the received packets. You can normally configure a NAT firewall to forward several ports to different hosts. As long as each client uses a distinct port (since there is only one outward-facing IP address), you can provide data to any number of clients this way, subject only to the limitations of the firewall.